NuVasive has announced the company’s acquisition of Vertera Spine, a privately-held medical device company developing and commercialising interbody implants for spinal fusion using patented porous polyetheretherketone (PEEK) technology. As a result of this acquisition, NuVasive is now the only medical device company to offer porous interbody technology across both PEEK and titanium materials. Vertera Spine’s product portfolio included two interbody fusion devices: the cervical Cohere and the lumbar Coalesce. Both are comprised of porous PEEK; a material which has been shown to lead to osseointegration in spite of the hydrophobic nature of smooth PEEK. 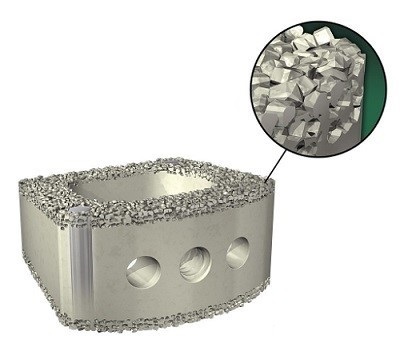 Vertera Spine’s technology provides a unique three-dimensional porous PEEK architecture to help elicit and encourage bone ingrowth using a proprietary processing method that is intended to retain strength and durability. Cohere is US Food and Drug Administration (FDA)-cleared and recently received a new ICD-10 code, issued by the Center of Medicare & Medicaid Services (CMS), effective October 1. COHERE is the only product approved for use with the new code, signifying CMS’ recognition of the innovation and potential clinical and tracking benefits of using porous PEEK. Coalesce has been granted FDA 510(k) clearance for use in anterior, transforaminal, posterior, and lateral lumbar interbody fusion procedures. Additional extensions for the device are planned for TLIF and PLIF procedures in multiple footprint, height, and lordotic angle configurations. Chris Lee, chief executive officer of Vertera Spine, says, “Since founding the company in 2013, our goal has been to help reach more surgeon customers and their patients with this disruptive technology. Together, we will now be able to better serve the market. Vertera Spine’s existing interbody product lines will be added to NuVasive’s portfolio for U.S. commercial sale and distribution. Terms of the acquisition were not disclosed.